The OFM moon Series fabric task chair is an ideal choice for the office, school or healthcare facility. 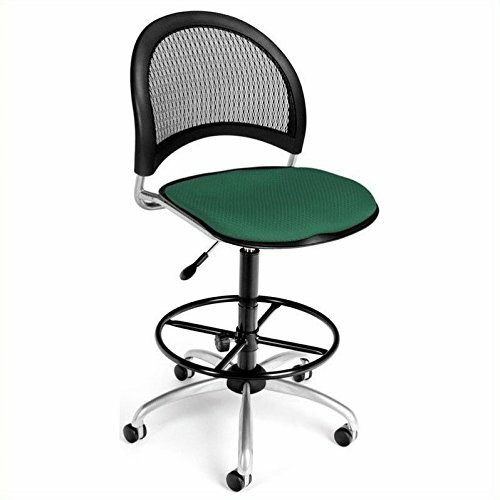 The stylish mesh back features a triple curve, extra thick design that provides built-in lumbar support. Simple and intuitive controls for seat Height adjustment plus a 360 degree swivel allow for customized comfort. And with the included drafting kit, you can choose either a 9" or 12" lift and add a foot ring for comfort at taller work surfaces. The long-lasting, stain-resistant fabric seat cushion is replaceable when it's time to update decor or change colors. A durable 25" steel 5 star base supports a steel frame with a silver powder-coated paint finish that will stand up to heavy use. This 336-DK-2201-OFM meets or exceeds industry standards for safety and durability, and is backed by OFM limited lifetime warranty.